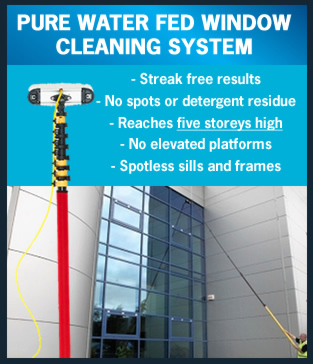 Swanbourne Window Cleaning is pleased to offer this environmentally friendly pure water cleaning service to clients who require windows cleaned up to five storeys high. The majority of work is carried out from the safety of the ground using the water fed pole system. Our window cleaning system created 100% pure water, leaving the windows spot free. There is no need for elevated work platforms or scaffolding which reduces the cost. For high reach window cleaning in Perth and surrounds call Peter on 0402 433 690 for an obligation free quote!